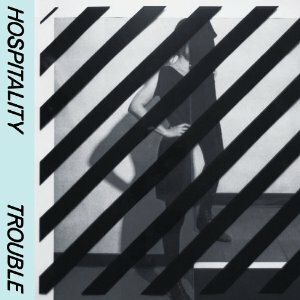 As evidenced on Trouble, the time Hospitality spent under the radar in 2013 crafting a follow up to their 2012 self-titled debut was well spent. The beauty of Hospitality was the way the forthright songs had a lot going on in the margins, both lyrically and musically. Amber Papini’s mid 20’s tales of NYC predated HBO’s Girls, but perfectly captured the sweet and sour vibe that both share. The thorny sophistication of 2012’s “The Drift/Monkey” single provided a bridge, and Trouble shows the maturation of their sound, but showcases its tricks in a different way. A kitchen-sink production approach could bury most bands, but opener “Nightingale” lays out the template for what is to follow: insistent opening verses unfolding into different instrumental journeys that all wind back to a satisfying conclusion. Replacing the wistfulness with a heady assurance, lead single “I Miss Your Bones” is the perfect reintroduction to the band. The real growth is evidenced in the frosty synth gem “Inauguration”, and the winning “Rockets and Jets”. Ending on a spare note, with the baroque “Sun Ship” and the spartan “Call Me After”, Hospitality’s strong suite is the power of song, and like their debut, Trouble is the very definition of a grower.